I had planned a long week break at the White Horse Inn Bunkhouse, in the Northern Lakes, to celebrate my Birthday with family and friends. Of course Jaffa my dog came along too and another friend bought their dog Banjo too. So it was an extend Alex and Jaffa adventure with other friends and Banjo too. The departure day finally arrived and a minibus complete with cages for Jaffa and Banjo, turned up to collect us from Lincolnshire for the journey to the Lakes. This was a great service provided by Just Transport Peterborough 07999 966205. We headed north through the Lincolnshire Wolds ANOB on what is known as ‘Bomb Alley’ and up into Yorkshire where we came off the A1 to stop at Squires Cafe (dog friendly) for lunch and a walk. We carried on up the Great North Road to Scots Corner where we joined the A66 to head west to Penrith. We stopped at the local supermarket in Penrith to get our supplies, which we learned had been opened by a member of the Royal Family, and then journeyed on to The White Horse Inn Bunkhouse in Scales, our accommodation for the next 7 days. We unpacked, were joined by a friend and went on a lovely short evening walk. We returned to find some other friends had arrived so we had an evening meal together in the Inn. We all thought the food was delicious and the staff very friendly. We returned to the bunkhouse, which is a converted stable, for the night. It was lovely and warm, the bed was comfy and I slept very well. We awoke to a beautiful sunny winter’s day and a great view over the valley below. 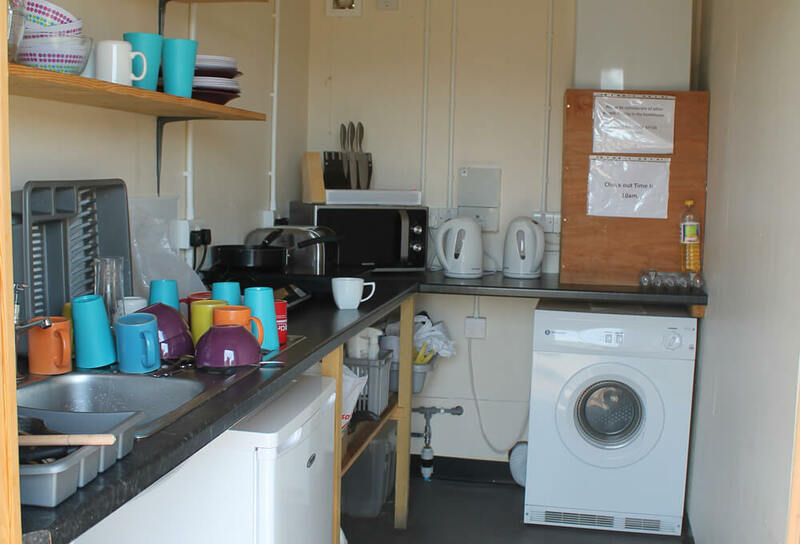 The well equipped self-catering kitchen had everything we needed to make our breakfast and pack-up for the day ahead. As it was a nice day we decided to head up Blencathra which is right on the doorstep. We went up the hard way, up Sharp Edge. Lots of climbing on our hands and knees, pushing the dogs up and slip sliding but we made it to the top to find snow and fog! 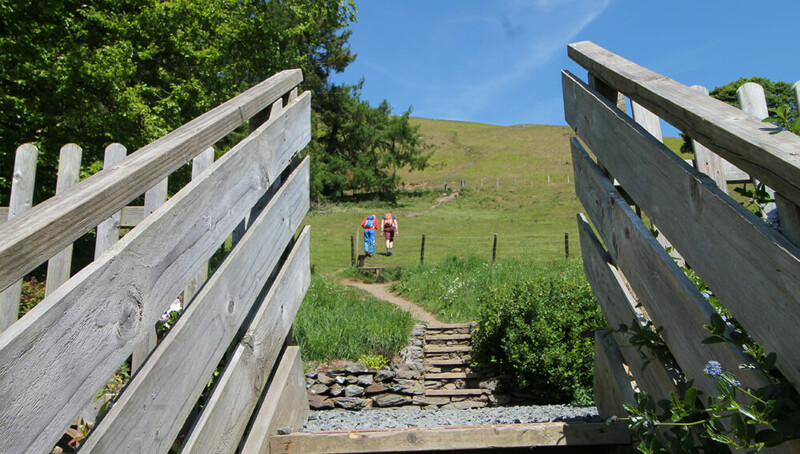 We headed west off the mountain, down to Blencathra Centre then through a lovely wooded valley and onto a permission path and then an old railway line walk and cycle trail into Keswick. We finished the walk in a very nice pub with chocolate cake and cream, before we found our minibus which took us back to The White Horse Inn Bunkhouse. After a very welcome hot shower we had another lovely meal in the pub and then returned to the bunkhouse for another comfy night’s sleep. We woke to another sunny morning. Today we were joined by a couple of walkers from Scunthorpe Ramblers who had seen my facebook page. After a chat we decided to get the minibus to take us to Keswick and drop us at the theatre beside the lake. From here we joined the Derwentwater Walk, a 10 mile way-marked trail around the lake. We stopped at the Ruskin Memorial on Friar’s Crag. Made from Borrowdale slate, the monument was erected in memory of the writer, thinker and painter, John Ruskin (1819-1900), who had many associations with Keswick. We looked at the view down to the lakeside and saw the stone marking the National Trust land. We followed the shore line until we reached Lodore Falls Hotel, a beautiful 200 year old building with lovely views back down the lake where we had come from. We reached the bottom of the lake and crossed a water meadow to a lovely Chinese bridge. The bridge had a plaque on it explaining how to look down into the water to see a picture. We then headed into some woods and came out near a house with a garage. In the garage window there was a teddy bear surrounded by postcards and letters from all over the world. Walkers who had seen the bear on their walk had gone home and sent these letters and postcards! We found an isolated beach and sat and had our lunch, looking back across the lake where we had walked. The next section of the walk was very peaceful, there was no road just a lovely winding path through the woods and meadows. We then arrived at Lingholm Estate, a big country house with walled gardens you can look around and a lovely open-plan tea rooms overlooking the walled gardens. They are open 9-5 all year round, except for Xmas. It’s very dog friendly, there were even towels to dry Jaffa off with. The staff were very friendly and told us how they love working there and meeting all the walkers. There is an on-site bakery that makes all the bread/scones/cakes for the tea room; many other ingredients come from the kitchen garden. I can recommend the scone with jam and cream. I can also recommend a visit here, even if you are not walking around the lake, you can park for free and walk around the grounds. They do alpaca walks, which sound great fun, but I didn’t have the funds to have a go. Next time, perhaps! Now rested and refreshed, we started on the last few miles of our journey. We followed the road through a village, over a bridge and then across a few fields and back into Keswick. We had a wander around Keswick before meeting our minibus which took us back to The White Horse Inn Bunkhouse. I can really recommend this walk, it is easy, mainly flat with a few little slopes. If you don’t want to walk all the way around in one go, there are jetties all around the lake where you can catch a boat back. In the winter they just run at weekends but in the summer they run more often. I am being to notice changes in my body clock and managed to have a nice lie-in this morning. After a late breakfast Margaret, myself and the two dogs asked the minibus driver, Aktar, to take us to Glenridding where a steam boat sales around Ullswater all year round. We caught the steamer to Howtown, (the staff on board were very friendly), there are two other ports, Aira Force and Pooley Bridge. You can walk all the way around Ullswater following the Ullswater Way Walk. If you are fit you can do it in one go. I did it one summer, but ended up doing it in stages and using the steamer to get back. We left Howtown and decided to walk the 5 miles to Pooley Bridge. After a mile of walking you have to decide whether to take the lower path near the lakeside or the higher path which goes up the fells to Cockpit Stone Circle. It was a very gentle climb with lovely views looking back at the lake and the mountains beyond. With daylight fading we headed off the fell and went down a lane to Pooley Bridge. I can recommend this walk, there are no stiles and it is easy climbing. On returning to The White Horse Inn Bunkhouse we cooked a very nice meal in the well equipped kitchen. Then we went on a 5 mile circular night hike along the lanes in the valley opposite. After another lie-in, Jaffa, Banjo and I decide to head up Blencathra which is directly behind The White Horse Inn Bunkhouse. This time we went up a different way. The views, in every direction, were still amazing, but a storm was on its way and the wind had got up. By the time we reached the top the wind was so strong that I couldn’t stand up. I had to go on my hands and knees so that I didn’t get blown away! We headed down the mountain to a tarn lake where we took shelter and had our packed lunch. We then came down following a different route, through the strong winds and proper Lake District rain! We eventually got back and took shelter in The White Horse Inn bar. In front of the warm open fire….what bliss. Jaffa met, Harold, another cocker spaniel and Harold’s owner and I chatted over a couple of drinks and a lovely treacle sponge with custard while we dried out. We then got ready and went north to a village called Metal Bridge and to the Metal Bridge Inn which is on the borders of England and Scotland. It’s here I had arranged to meet an old work colleague from Scotland. We had a catch-up over a very nice meal. The staff were very friendly, it’s dog friendly and it’s next to the M6 junction, which is handy if you are travelling north or south. We headed back south to The White Horse Inn Bunkhouse at Scales. The storm was at full strength but we were comfy, dry and warm in our room. We woke with excitement this morning as I had made it to another milestone. A milestone birthday starting with 4! So we needed to do something special – a walk to remember. After a bowl of porridge which I made in the self-catering kitchen, we got a lift with some other people who were staying in the other bunkhouse to the Lingholm Estate. We headed along the lakeside, in the opposite direction to the way we walked earlier in the week. We then branched off up Catbells. The higher we climbed, the more windy it got, until we could hardly stand and at times ended up going on hands and knees. We arrived at the top trig point and were thinking of going higher onto the next ridge. But we decided to retreat down to the bottom and across a field to reach the Derwentwater Walk we had done the other day. We followed this, passing the teddy bear garage and along the lake side past an outdoor pursuit centre and back to the Lingholm Estate. We returned to the cafe for a nice tiffin cake and lemonade. Jaffa had clean towels to dry himself with and a tin of biscuits, which he loved. We then got picked up and taken back to The White Horse Inn Bunkhouse where my family were waiting. I had a lovely hot shower, got changed and headed down to the pub for a great meal with family and friends. On our return to the bunkhouse we had a winter wonderland walk through snow. After another great night’s sleep, we woke to see snow capped hills all around us. As my Mother had joined us for the day and is not a walker, we decided to go into Keswick. The minibus dropped us outside Keswick Museum which had won an award, but unfortunately it was not dog friendly. So we headed into town and looked at the shops. Most of them were, thankfully, dog friendly. We then headed to St John Street to a flame grill pizza restaurant for lunch, (small dogs very welcome!). We had a delicious pizza which we could see being cooked in the open fire. After lunch we headed to the Puzzling Place. It’s full of optical illusions, great fun to do, does not cost much and is dog friendly. We then went around the outdoor shops looking for a new dry rucksack. Then we headed through Hope Park and down to the lakeside of Derwentwater. We went into the Cafe by the Lake, the staff were very friendly and helpful and we had a nice afternoon tea. It is dog friendly but unfortunately you have to pay for the dog treats. We sat and admired the views across the lake towards Catbells (yesterday’s walk) which had a sprinkle of snow on its top. We had a little stroll beside the lake before darkness set in and then the minibus picked us up and we returned to The White Horse Inn Bunkhouse for a nice warm shower. We went down to The White Horse Inn bar where we sat beside the fire. Mum had a lovely bowl of soup and I had a chip butty. It wasn’t on the menu, but the chef very kindly did it for me. The end of another lovely day. We woke to another sunny clear day with snow capped hills. After another super warm shower and a nice big bowl of porridge I packed the rucksack and headed up Blencathra. It’s straight up from The White Horse Inn Bunkhouse, Jaffa didn’t need to go on the lead. On reaching the top we headed east along the ridge. There were lovely views towards Penrith. Just below Bowscale Fell we came off the ridge and headed down to the valley bottom and River Caldew. As there wasn’t a bridge we had to wade through the river. Jaffa had to swim, it was quite deep due to the rain and snow and added a bit of adventure to our walk. We then headed west along the valley on the Cumbria Way. The bottom of my Trespass boots came off(! ), which made walking hard and my socks wet. Slowly we climbed out of the valley to Skiddaw House, the highest hostel in Britain which you can only reach on foot. We sat on the porch with some other walkers who were better organised than me and had string and spare laces. A good walker should always carry string and spare laces in case a lace snaps on the walk. How many of us don’t? I have some in my big rucksack but not in my day bag. After lunch we decided, due to the time, rather than heading high to Skiddaw summit, we would carry on along the Cumbria Way heading south to Keswick. It was a proper winter wonderland with snow and ice. We climbed over iced up streams, then after resting a moment or two, we did one final climb up to Latrigg before descending into Keswick. What a great walk, I would recommend it to anyone, on a clear, sunny day like today with no wind or rain. On arriving in Keswick I needed to buy a new pair of boots as my Trespass pair had only lasted a few months. I went into the shop I had earmarked for a waterproof rucksack the day before. I love these, as you don’t need a dry bag inside them as they are made from 100% waterproof material. I got a new pair of boots, reduced from£200 to £70. I hope they last more than a few months, fingers crossed! We then had a walk around the Saturday market, there was loads of local produce and wares to look at. Then we went to a pub called The Oddfellows Arms. They do a 3 course meal for £14 or 2 courses for £10. I can recommend it. The food was delicious and the helpings good. The minibus picked us up and took us back to The White Horse Inn Bunkhouse. Another great and final day of the holiday. There are still loads of walks from the doorstep of the bunkhouse that I have not done. For example, heading west towards Penrith or south over the hill and down to the valley below. Hopefully I will be back sometime to explore more. We packed up and headed off after a great week. 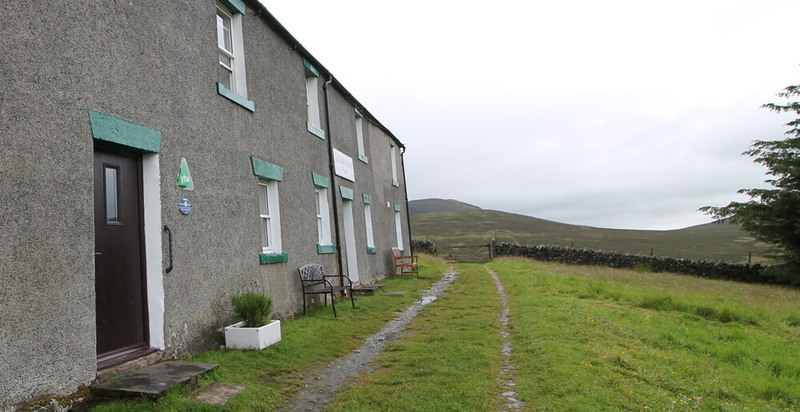 To sum up the bunkhouse: the showers were great, the beds were comfy and the the bedrooms were warm and cosy. The kitchen had everything you needed for self-catering and the dining room was ok but the best place to socialise was in the pub. With it’s lovely with its open fire, delicious pub grub and board games the White Horse in was the perfect place to spend the evenings. I can recommend it. Lots of bunkhouses and hostels provide dog friendly accommodation and you can see all the bunkhouses and hostels in the Northern Lakes, Keswick and in the Lakes District here. There are also over 100 bunkhouses and hostels that are within walking distance of a pub.